The Process Device Manager SIMATIC PDM 8.1 is herewith released for delivery. 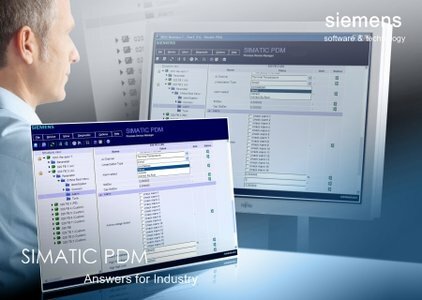 SIMATIC PDM 8.1 features numerous new and improved functions, additional product versions, updated device descriptions and integration of additional field devices. SIMATIC PDM (Process Device Manager) is a universal, manufacturer-independent tool for the configuration, parameter assignment, commissioning, diagnostics and maintenance of intelligent field devices (sensors and actuators) and field components (remote I/Os, multiplexers, control room devices, compact controllers). With more than 2500 device descriptions for a device range from over 200 global manufacturers, the library supplied with SIMATIC PDM is probably the most extensive one available on the market. Functionality, performance and ease of use are expanded, rounded out and improved with SIMATIC PDM 8.1. More info: Linki görebilmek için giriş yapmanız ya da üye olmanız gerekir. Siemens PLM Software, a business unit of the Siemens Industry Automation Division, is a leading global provider of product lifecycle management (PLM) software and services with 6.7 million licensed seats and more than 69,500 customers worldwide. Headquartered in Plano, Texas, Siemens PLM Software works collaboratively with companies to deliver open solutions that help them turn more ideas into successful products.